Fall Out Boy emerged as the biggest underground band in the early 2000’s with the release of their debut album, Take This to Your Grave, a seminal pop punk classic. But it was the release of their second studio album, From Under the Cork Tree, that catapulted them to global superstardom with unprecedented fanfare. Since then, Fall Out Boy have released six chart topping albums, amongst a string of smash hits. Fall Out Boy have remained as brave and bombastic as ever to fans both new and old, selling out arenas across the globe and continually releasing genre defining classic album after classic album. True to form, Fall Out Boy continue to push the boundaries as they experiment with their sound on the release of their forthcoming seventh studio album, M A N I A, with frontman Patrick Stump enthusing, “This record is most off-script we’ve gone… I want to invent something new”. Young and Menace and its follow up, Champion, are the first two singles off their forthcoming album which is their most adventurous and ambitious to date. The record is an ode to what the band does best - reinvent themselves. This time around Fall Out Boy set out to unite both the personal with the political, mixing lyrics that are poignant and nostalgic with a heavy dose of cultural commentary. Young and Menace reflects on what bassist Pete Wentz describes as “real world implication”, whilst Champion pays homage to the rock roots of the band, as frontman Patrick Stump chants victoriously on behalf of all underdogs, “If I can live through this I can do anything”. Both singles are a taste of what’s to come, with success and critical acclaim already praising M A N I A. Fall Out Boy remind us why they’re one of the greatest thriving rock bands whenever they hit the stage. The volume and energy of their floor-filling, sing-a-long anthems are intensified, as the flair and theatrics of each member urge a stadium of fans to express themselves and fist pump in solidarity. 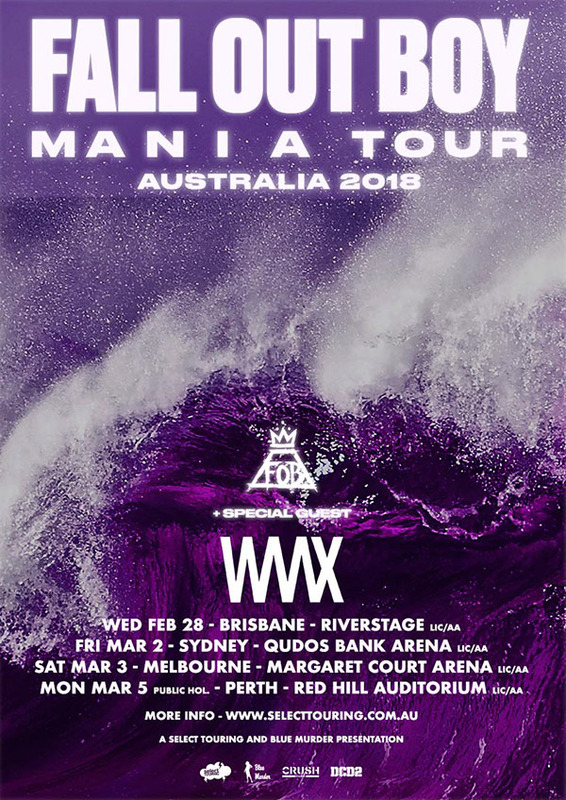 Joining Fall Out Boy will be Brisbane’s very own vibe-punks WAAX. Following the release of their punchy five track Wild & Weak EP earlier this year, the five-piece sold out shows across the country and have since become seasoned favourites on triple-J and radio nationwide. Helmed by the formidable and ferocious Marie DeVita, WAAX is a live force to be reckoned with. Fall Out Boy - Patrick Stump (vocals/guitar), Pete Wentz (bass), Joe Trohman (guitar) and Andy Hurley (drums) - have cemented their position as bona fide rock superstars and one of rock music’s biggest-selling bands. Now, Fall Out Boy are heading back Down Under with a new album in tow and they’re ready to cause M A N I A. Fall Out Boy’s M A N I A will be available Friday 15th September and is available for pre-order from Apple Music.